Far Infrared rays (FIR) are invisible and present in sunlight; they were discovered by a scientist named Sir William Herschel in 1800. His research led to the discovery that there were not only the known visible rays – red, orange, yellow, green, blue and violet – but there were also invisible rays later named Infrared. Approximately 80% of solar energy is made up of FIR and 60% is between the range of 10-20 microns. Far Infrared Rays are the healthy rays contained in sunlight that are responsible for photosynthesis which is the process used by plants to produce energy and without which there would be no life on earth. Albert Szent-Gyorgi, Nobel Prize Winner and the discoverer of vitamin C, believed that all energy from the sun has profound effects on us. His research showed that light can literally stimulate the body’s basic biological functions – modern research is showing that Far Infrared does indeed stimulate metabolism. Far infrared Rays Do Not cause sunburn and damage your skin & should not be confused with Ultraviolet Light which can cause sunburn and damage the skin. They penetrate many objects including Human tissue. They exhibit features of light such as travelling in straight lines, but can be deflected & reflected. Wavelengths of light can be measured in millimeters but are usually measured in units called microns just because the measurements involved are so small; for example 0.00076mm. Near Infrared is the shortest wavelength through to Far Infrared which is the longest ranging from 0.003mm – 1mm. Note: Different organisations provide variations on the above classification. These divisions are not precise and vary according to the publication you read. We refer here to the system recommended by The International Commission on Illumination (CIE). The human body generates FIR between 8-14 microns. When our bodies are heated by FIR rays the activity level of our atoms are increased and heat can be generated. Albert Szent-Gyorgi, Nobel Prize Winner and the discoverer of vitamin C, believed that all energy from the sun has profound effects on us. His research showed that light can literally alter the body’s basic biological functions. Night vision goggles used by the military detect the Infrared Rays generated by the body. Our bodies radiate Far Infrared energy through the skin at 3 to 50 microns, with most output at 9.4 microns. Our palms emit Far Infrared energy too, from 8 to 14 microns. Palm healing, an ancient tradition in China, has used the healing properties of Far Infrared rays for 3,000 years. Yogis in India also employ palm healing and recommend it especially for relieving eyestrain. Far Infrared Rays are invisible wavelengths of light that are longer than that of visible light. 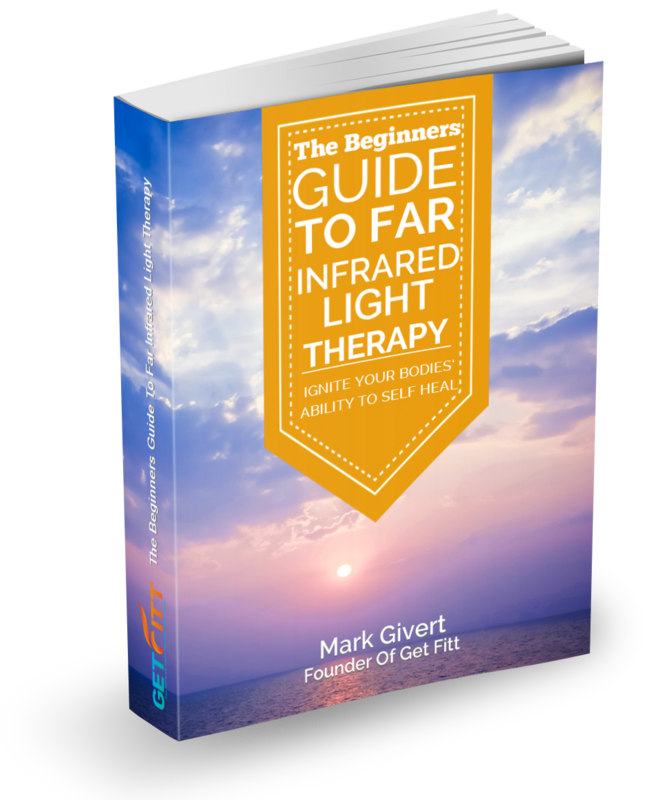 Far Infrared is rapidly gaining popularity as a safe therapy for natural health care. When this invisible wavelengths of light are absorbed by the cells of the body this can be felt as heat. When the body absorbs Far Infrared Rays it is like being in the sunshine the body is warmed up, you feel nice and relaxed full of energy. Far Infrared Rays penetrate the body deeply helping gently warm your body at low temperatures – even as low as 370C which is body temperature. Far Infrared rays warm your body directly and NOT the AIR. Conventional saunas however can be very uncomfortable as they operate at high temperatures between 65 to 950C, using the hot air or steam to heat your body. The skin becomes heated and transmits this heat to the cells closest to the skin. 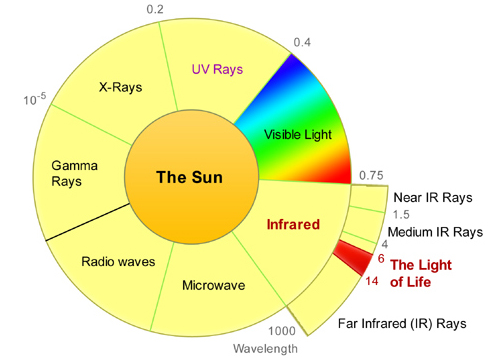 Far Infrared Rays are the invisible light waves from the Sun that warm our bodies directly, without heating the air. They penetrate deeply into our body helping make us feel warm, energised and healthy. We can experience Far Infrared Rays on a cold cloudy day. When the sun comes out we become warm, when the sun disappears we once again become cold. The air temperature did not change at all, yet we became warmer in the sun due to the Far Infrared Rays. Far Infrared Rays help warm up the body at low temperatures even less than your own body temperature (380C). What is unique about Far Infrared is that you can still sweat at such low temperatures. Lying on a Beach the sand emits Far Infrared Rays helping you to relax and detox. Your palms emit healing Far Infrared energy too, from 8 to 14 microns. Far Infrared energy is absorbed very easily by the human body and Far Infrared Sauna Therapy is being included in detoxifcation programmes by a growing number of Doctors and healthcare professionals worldwide. Due to today’s high levels of stress and toxicity the body’s natural ability to heal, is often compromised. Some of us have reached critical stress and/or toxic levels and we do not have the energy to detoxify or repair our bodies. The body generates Far Infrared energy that normally occurs within our tissues and is associated with a variety of healing responses. Far Infrared Thermal Treatment can leave you feeling relaxed and energised. Healthcare and medical professionals in Japan (and more recently in Canada) have been using far infrared thermal systems to rehabilitate and treat a multitude of ailments for many years now. If you are unable to maintain or follow through with a physical exercise program then the Far Infrared Healthcare programme could be just right for you. With Far Infrared Thermal Treatment there is no need to use high temperatures to sweat. You can work at a little above room temperature and still benefit. Far Infrared Thermal Treatment is able to warm the body without raising air temperature. It is this unique quality that makes it such a gentle and comfortable treatment. Conventional saunas, Turkish baths and spa therapies often involve high temperatures ranging from 65-950C and can cause a dramatic increase in body temperature. In fact many people do not tolerate extreme heat at all well.This is something the whole family can use and it is just so portable, easy and convenient to use at home or to travel with. Toxicity is a fact of life today and just as you would go the gym and exercise regularly to keep fit, similarly it may be wise to regularly detoxify due to our constant exposure to toxins. Learn more about our Far Infrared Saunas by clicking here.